Consumers in the US are growing more comfortable using their phone to make payments, whether in apps, in stores or to each other via messaging platforms and virtual personal assistants. But mass market adoption isn’t assured, especially if the value such payments provide fails to extend beyond just replacing a card swipe or dip with a tap of the phone. eMarketer predicts that US proximity mobile payment value will more than double in 2017 to $62.49 billion. Thanks to robust growth through the forecast period, such payments will exceed $314 billion by 2020, surpassing US mobile commerce retail sales made via smartphones and total US mobile travel sales. The number of proximity mobile payment users in the US will climb 32.4% in 2017 to 50.8 million. By 2020, close to one-third of US smartphone users will use proximity payments at least once every six months. This report includes eMarketer’s inaugural mobile peer-to-peer (P2P) payments forecast, which anticipates transaction value reaching $59.42 billion in 2016. By 2017, mobile P2P payments will climb to $92.10 billion, slightly surpassing the value of proximity payments. The number of adult mobile P2P users in the US is growing. Close to one-quarter of US adult smartphone users will either send or receive money via their devices at least monthly by the end of 2016. That number will increase nearly 32% in 2017 and by a further 25% in 2018. 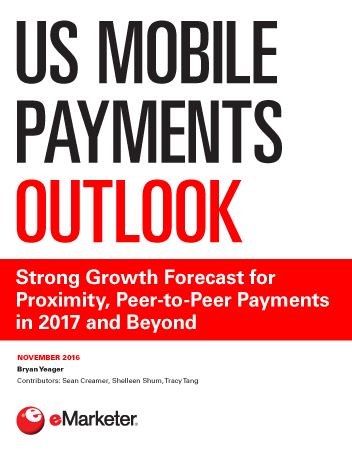 "US proximity mobile payment transaction value will more than double in 2017 and continue to experience robust growth. By 2020, US consumers will use their phones to pay for more than $314 billion worth of goods and services at the physical point of sale."